In last Sunday’s paper the following ad caught my eye: “Real, Fragrant Mistletoe Shipped Direct To You From the Mountains of Oregon.” I looked at the festive sprig of green leaves and pearly white berries secured with a bright red bow and smiled. I’v got plenty of mistletoe right outside my front door, thank you. Now that the oaks have shed their leaves, I can see green azalea-sized clusters of mistletoes (Phoradendron serotinum) nestled comfortably in the bare branches. When it comes to Christmas trees, there’s nothing like the real thing. In fact about 25 – 30 million Christmas trees are sold in the U.S. every year. When you bring a live tree into your dwelling during the holiday season-yes, a cut Christmas tree is very much alive despite being severed from its roots-you need to keep its tissues hydrated, which affects it longevity. Over time water is lost through the needles. Eastern red cedar and Atlantic white cedar dry out rapidly, while Fraser fir and noble fir lose water much more slowly. Water can be replaced via the cut end of the trunk. To facilitate this make a fresh cut an inch from the end of the trunk before you put your tree in a water-filled tree stand. Experiments with additives such as floral preservatives, sugar, and 7-Up® have shown to provide no benefit over pure water, but the tree stand must never be allowed to dry out. How long a cut tree survives depends on the freshness of the tree when purchased, and how long it is kept moist. A friend of mine from New Hampshire kept his cut balsam fir in a cool room with ample water long after the holidays. In fact, it actually put out several inches of fresh needles in early March. It may seem unusual for my friend to keep a Christmas tree for that length of time, but it makes sense for someone who never takes down his Christmas decorations. It’s tough being a houseplant during the winter, especially during the holiday season. Besides reduced light levels and low humidity, you have to give up your favorite spot near the window to seasonal plants like poinsettias, Christmas cactus, and amaryllis. If that’s not enough, you’re often faced with a caregiver who’s intent on watering you like a holiday plant: too often and too much. The result of this treatment often causes houseplants to meet the Fate of most of their holiday kin: the top of the compost heap. To avoid the Fate of recycling your houseplants, you may have to make a few adjustments to their indoor accommodations. Because the winter sun is lower and farther to the south, plants receive fewer hours of less intense light. So, houseplants that were exposed to low light on the north side of the house can be moved to east-facing windows. Plants near east-facing windows can be exposed to more sunlight by moving them to a south-facing window. Plants that were located on stands away from direct sunlight can be moved closer to a less exposed window to give them more light. In dimly lit rooms, rotate the plants every week or so. Low moisture levels in the home during the winter can be uncomfortable to us and harmful to some houseplants. Relative humidity levels of 10 or 15 percent indoors can be tolerated by cactuses and succulents like snake plant (Sansevieria), cast-iron plant (Aspidistra), and various dracenas. Most others need a relative humidity of 40 to 60 percent. When exposed to these low moisture levels during the winter months, the leaves of most plants lose water faster than their roots can absorb it. As a result, the leaves curl, their tips turn brown, and flowering plants may drop their flower buds or flowers may wither up prematurely. Move sensitive plants to cooler locations or to rooms that tend to be more humid than others such as the bathroom, kitchen (away from the oven), or a well-lit basement. Water lost by leaves and potting mix raises moistens the air of its neighbors. Using a room humidifier or cool-mist vaporizer. Track humidity levels with a digital hygrometer so you can increase levels that will match your comfort, too. The ideal moisture level for people is between 30 percent and 50 percent relative humidity. Setting pans of water on radiators or wood stoves. Placing high humidity lovers on a pebble-filled tray of water inside an aquarium tank with an adjustable opening at the top. A small fan will improve air circulation and a heating cable under the tray will speed up evaporation. One final tip regarding winter houseplant care is to avoid overwatering: the biggest cause of plant death during the winter months. Water according to the needs of the plant. Plants that are resting should be watered sparingly. Keep flowering plants moderately moist and watered when the surface of the medium feels dry. Winter and the holidays can be a challenging time of year for both plants and people alike. However, by offering our houseguests a little attention now will help them realize the destiny we prescribed for them: to brighten our homes with their presence…next Spring. 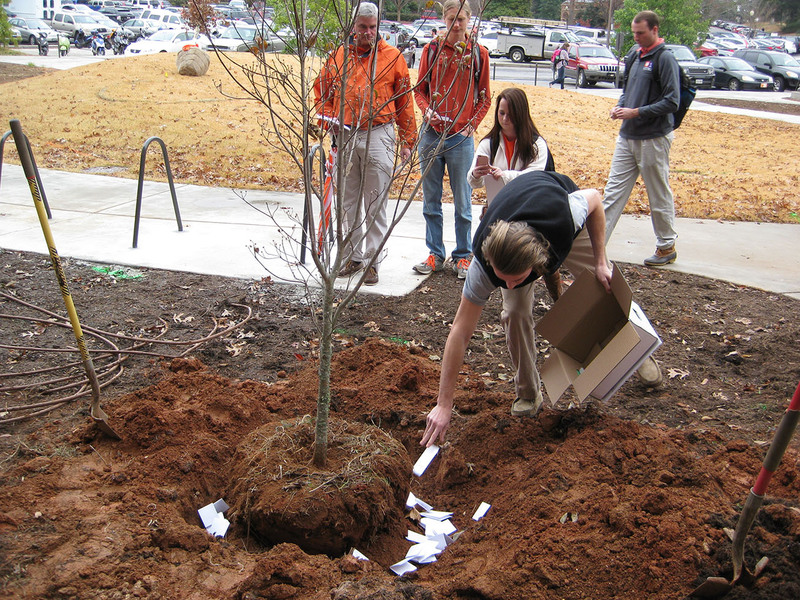 Clemson University celebrated Arbor Day with a “Memorial Tree Plant Dedication” hosted by the Student Government Sustainability Committee. A Cherokee Princess flowering dogwood was planted in memory of the following Clemson University students who passed away this year: Kenneth Davis, Virginia Gilliam, Tucker Hipps, Andrew O’Neill, and Kendall Wernet. “Once there was a tree and she loved a little boy” is the first sentence in the children’s book: The Giving Tree. This story chronicles the lifelong relationship between a boy and a tree. From boyhood to his golden years, this tree selflessly gives all that it has to the boy: leaves, shade, a place to hide, and so on. I won’t spoil the ending for you. Each time I read this story by Shel Silverstein, I’m reminded of Arbor Day, a day that emphasizes the importance of trees in our lives. National Arbor Day, founded by J. Sterling Morton in 1872, was April 25 this year, always the last Friday in April. South Carolina has been celebrating Arbor Day since 1934. It falls on the first Friday of December, which is today, Dec. 4. Arbor Day at the national and state level encourages us to plant and care for trees.